Living Area 4,445 Sq. ft. 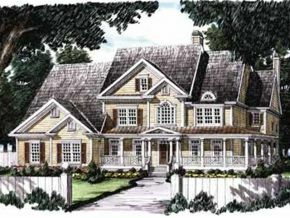 This two-story farmhouse has much to offer, with the exciting feature being the opulent master suite. French doors access the large master bedroom with its coffered ceiling. Steps lead to a separate sitting room with a fireplace and sun-filled bay window. 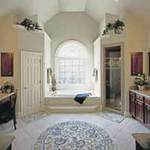 His and Hers walk-in closets lead the way to a vaulted private bath with separate vanities and a lavish whirlpool tub. One the first floor, an isand kitchen and a bayed breakfast room flow into a two-story family room with a raised-hearth fireplace, built-in shelves, and French-door access to the rear yard.